These are abbreviated definitions…please refer to your flower show schedule or judging guide for complete descriptions. A style in which the plant material and accompanying components are arranged for their distinctive characteristics which may be form, line, color and texture. The designs are bold, emphasize negative space and interest is shared throughout the design. These designs may interpret a subject or be without a theme. Floral designs that have adapted traditional or modern Asian design styling. A three-dimensional abstract design of plant material and other components. A compact constructed round design consisting of formal rings of flowers; contemporary Biedermeier designs employ strong groupings and sometimes include non-plant material. Designs utilizing a skilled craft which uses all dried plant material as well as excellent design and craftsmanship. A design created with layers of trailing plant material that appear to flow; for instance as a waterfall. Floral design that does not follow traditional design styles, but uses creativity to develop unusual approaches to atypical designs. Fruits, vegetables and flowers that are used in wreaths or garlands inspired by the ceramic objects of Luca and Andrea della Robbia. A contemporary design style which is not limited by any specific style; that is allowed to be unconstrained and follows the elements and principles of design. A suspended design that is generally hung from a frame or hook. A design in which the plant materials/ components are arranged parallel to the horizon. A design in which components are chosen and placed to evoke a theme, occasion, or atmosphere; not a design style. A contemporary horizontal design with stacked plant material placed horizontally. Additional materials may be placed in a vertical and/or diagonal manner. No focal point. A design expressing motion, actual or implied. Modern line design: minimum of plant material; strong contrast in form and texture. There may be more than one point of emergence for plant material. Traditional line design: line predominates by a restrained use of plant material. 1. Modern line-mass design: are bold and dramatic; may have more than one point of emergence. Components may emphasize contrast of texture, color, and line. Main directional line may be horizontal, vertical, or diagonal. 2.Traditional line-mass design: blending mass and line designs with an open silhouette; usually asymmetrical with a rhythmic flow. A design style employing groups of plant materials that emphasize strong colors, textures, and contrasting forms. .
An abundance of flowers with a range of forms and sizes that are arranged in a closed silhouette form that has few open void areas within the design having more solids than voids. A design which features many types of blossoms of similar sizes that are placed randomly in a circular form. A small design in which the plant materials /components are no larger than five inches in any direction. A suspended design in which the parts can be moved by air currents. A design of any style in which three or more parts of a plant of one family or genus are used. Part may be stem(s), bloom(s), foliage, roots, fruit, etc. A design of plant material of just one color including the shade and tints of the hue. Some small amounts of green foliage is allowed with the chosen single color; small bit of attached non-conforming floral parts are permitted e.g. the yellow center of a purple aster. Unless stated in the schedule, the container, bases and/or stands do not need to be the same color. 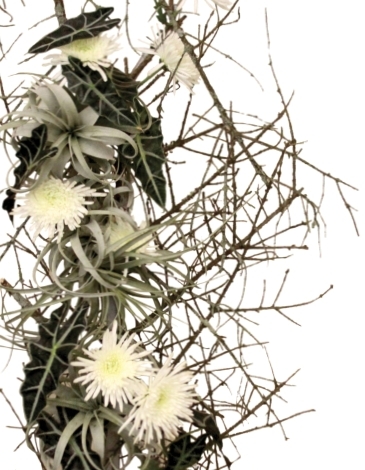 A design that uses both plants and cut flowers to create an organized arrangement. A stationary design with implied motion. A floral design which combines plant materials and objects to interpret a class title in a flower show. Objects should dominate and must convey the feeling of being true to normal size and function but may not be arranged to create a scene. A design with two units of unequal size that are joined by a prominent stretch component. The smaller unit should appear to be pulled away from the larger unit. Tension between the two objects is essential. A contemporary design style including 3 or more containers. Each unit is either a partial or complete arrangement which, when combined with the others, makes a unified whole. Functional: a table exhibit arranged for dining that may include: dishes, glassware, linens, and floral design(s) with or without other components. Exhibition: a display that uses the components of dining in an artistic manner as a coordinated design. a decorative technique that encircling materials in a decorative manner. 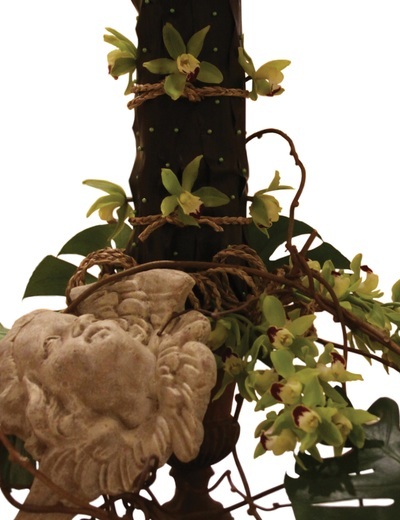 materials that are placed to create textural detail and/ or decoratively cover floral form or other mechanics. materials are ties together into units or bunches; the primary purpose is functional, to hold stems together or in place, but can also be decorative. like materials are placed close together in groups. materials are trimmed into a form such as a topiary. overlapping materials to create texture with; space between the materials may be varied. a technique in which like plant material is placed closely together to form a pattern. plant material clustered to appear as one large flower. the manipulation of foliage to form three dimensional rolls that may be secured with glue, staples or any other method. Mechanics must not show. component(s) or plant materials that forms an enclosed space and thus becomes a protected area and/or focal area. the placement of like materials, (individually or in bunches), placed side by side or on top of each other with no space in between. materials are over-lapped to create a stepped effect. visually light materials such as threads or asparagus fern are placed over solid forms that form an overlay effect. lacing materials to create a surface texture. A design which resembles a trimmed or trained plant, shape or animal, with or without accessories. A design based on established approaches with the placement of plant material that generally radiates from a central point. .
A contemporary style in which part of the design is seen through a component such as mesh, screen, glass, etc., This is an integral part of the design and is three-dimensional. A front and back design organized in one or more containers which are joined to appear as one. The back and front are contrasting by the use of color, texture, or pattern, etc. A contemporary style in which all or part of the design must be under visible water. A design of grouped plant materials, that are placed as they grow naturally (noting: geographically, seasonally and proportionally).